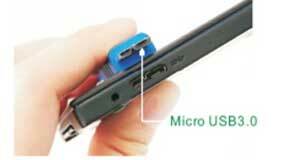 USB3.0 cable (Universal Serial Bus 3.0 cable) supporting 5 Gbps data rate. Backward compatible with USB 2.0 & Minimizing connector form factor variations. Managing EMI & Supporting On-The-Go (OTG).